Mist on Purple Lake greeted us when we woke up. 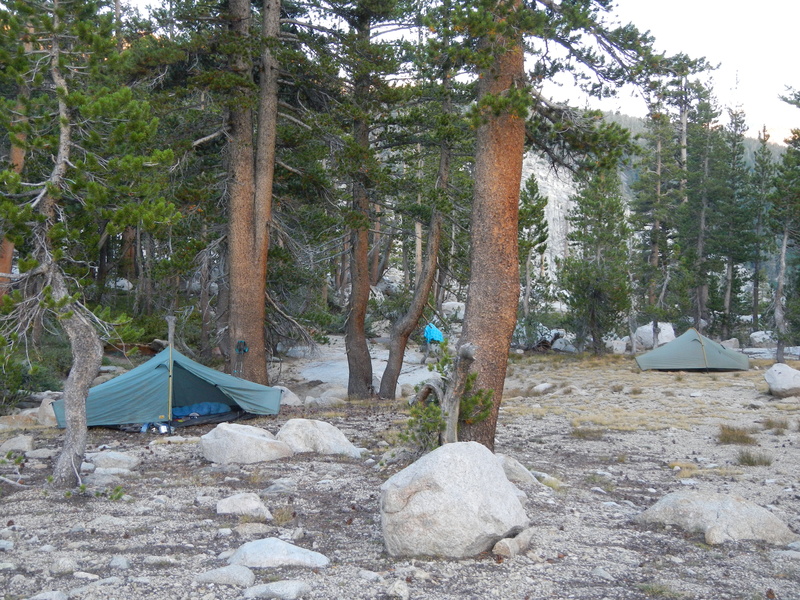 The scenic backdrop of our campsite at Purple Lake. 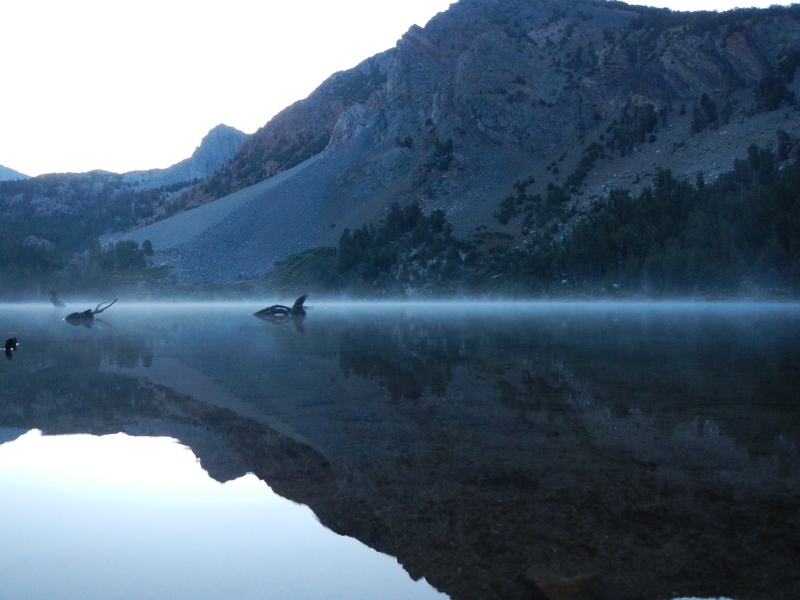 This morning, Purple Lake seemed to live up to its name. In the mist, it was a lovely violet. Immediately upon leaving the lake, we started to climb, up past a big rock glacier (there’s ice under there somewhere!) and into the high country. Goodbye to Purple Lake. 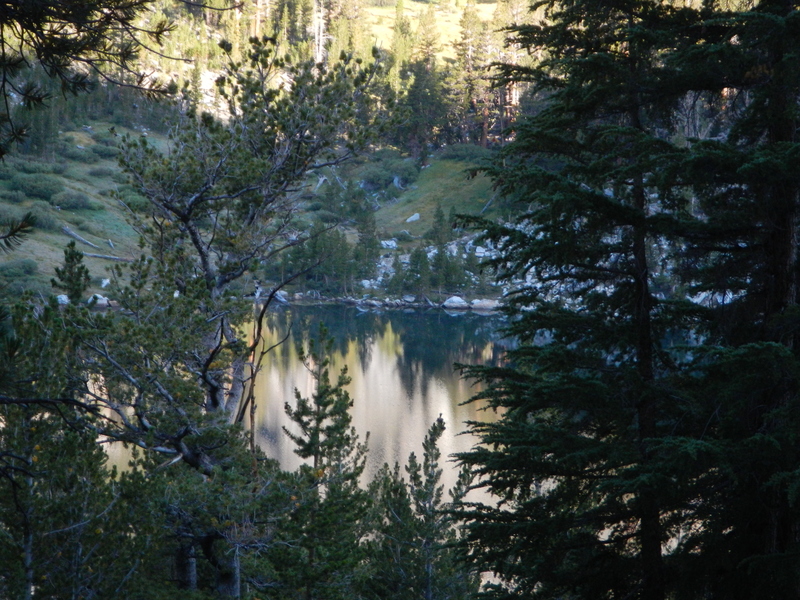 Our campsite was in the trees to the far left across the lake. Beautiful Silver Pass Creek! I got naked and rinsed the dust and sweat from my body and am now feeling like an ad for Smartwool, with clean socks and long underwear. 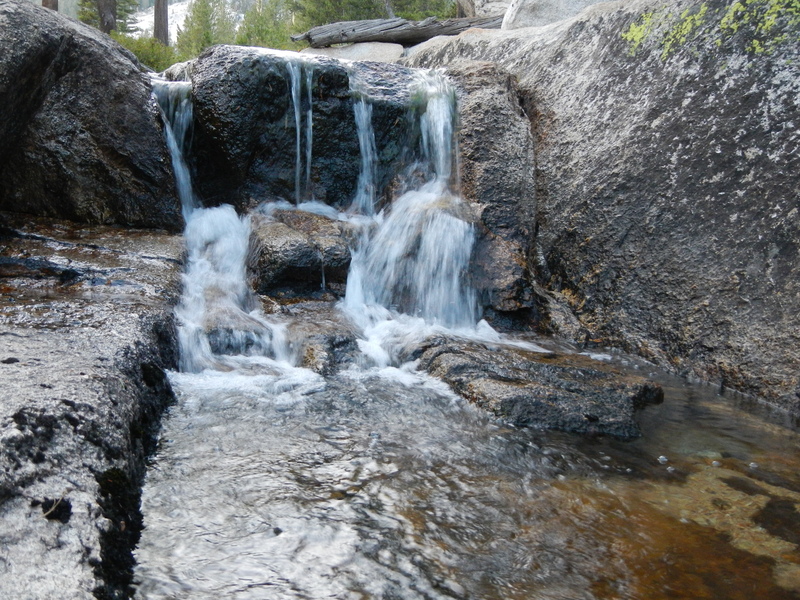 The water isn’t so cold here, as it travels at a moderate pace over exposed granite all the way from Silver Pass Lake. Lots of time for the sun to warm it up a bit. All my clothes are rinsed out, too, and lying on rocks in the sun (with little rocks to hold them down in the light breeze). Grasses, water, rocks, trees. We climb toward Silver Pass. 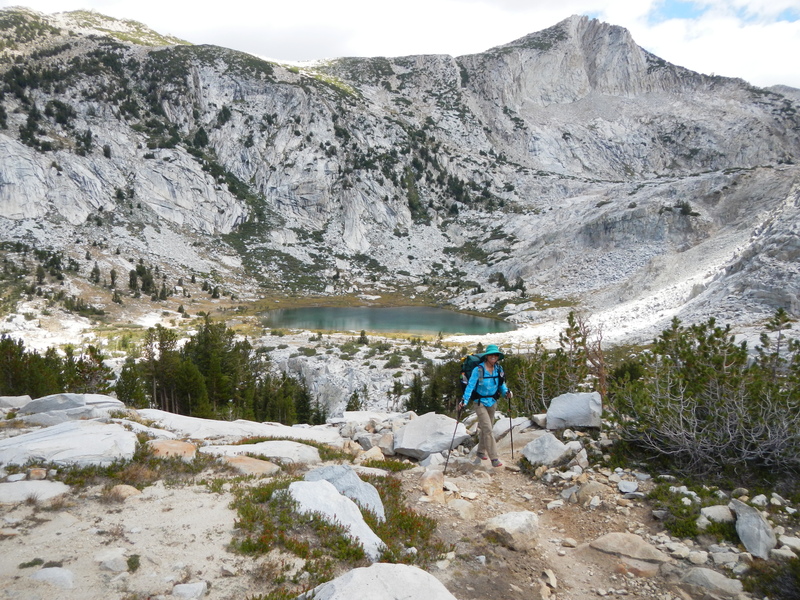 A good long hike today, almost 13 miles from Purple Lake and up and over Silver Pass (elevation: 10,900’). The clouds of yesterday are mostly gone and the sky is beautiful. Most of the uphill was through fir and lodgepole pine forests, which made for a more pleasant ascent (shade was plentiful). No altitude problems. I love the high country! 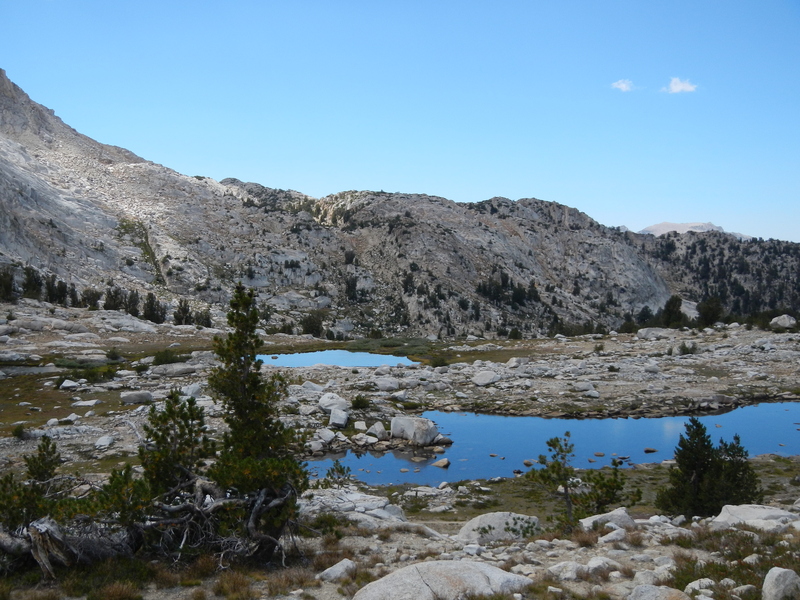 In every mountain cirque there was a little lake. I wanted to visit them all! Thus ends my journal entry for Day 9. Not much verbiage, so I thought I’d talk about what we have been eating on the trail. Betty was the mastermind behind it, and generally (except for the salmon), everything has been great. For breakfast, I settled in to mostly having plain instant oatmeal with freeze-dried bananas and apples. It’s easy, like all our hot food: just add hot water. I also have a nice cup of Earl Grey tea with Nido milk powder and a teeny bit of sugar (at home, I’d opt for honey, but that’s too heavy to carry). I already talked about lunch in another post, I think, so we’ll move on to dinner. For this meal, we could choose a base of brown rice, noodles, or mashed potatoes. Then we would pair it with either some sort of beans (black or pinto), tofu cubes, very occasionally (once/week) some fish for me, or lentils. To this we would add our choice of dried vegetables: squash, seaweed, daikon radish, shiitake mushrooms, sweet potatoes, and a few other things I can’t recall right now. Then came the seasoning choices: lemon or lime, coconut milk and curry paste, various hot sauces, miso soup, olive oil infused with garlic. Twice, we made a delicious chili with beans and mashed potatoes and a premixed seasoning. We would put all these ingredients together in a ziplock bag, pour hot water in, and let it “cook” in a homemade cozy made of Reflectix and tape. Then generally, we just ate the dinner out of the bag, and added the used bags to our trash. Very simple and effective. I tended to not eat very large portions at the end of the day. I just didn’t feel like it by then. But I never felt deprived or went to bed hungry. During the day, we also had little bags of snacks, our favorite by far of which were the dried fruit combo of figs and mangos (we called these “wet fruit,” to differentiate from the freeze-dried fruit I ate for breakfast). Every day we each got a Nature Valley granola bar, generally with dark chocolate, and a small bag of mixed nuts and cacao nibs. These were easy to munch on as we hiked. And every other day, we got a treat of a fig bar! Almost everything was organic. Good work, Betty! 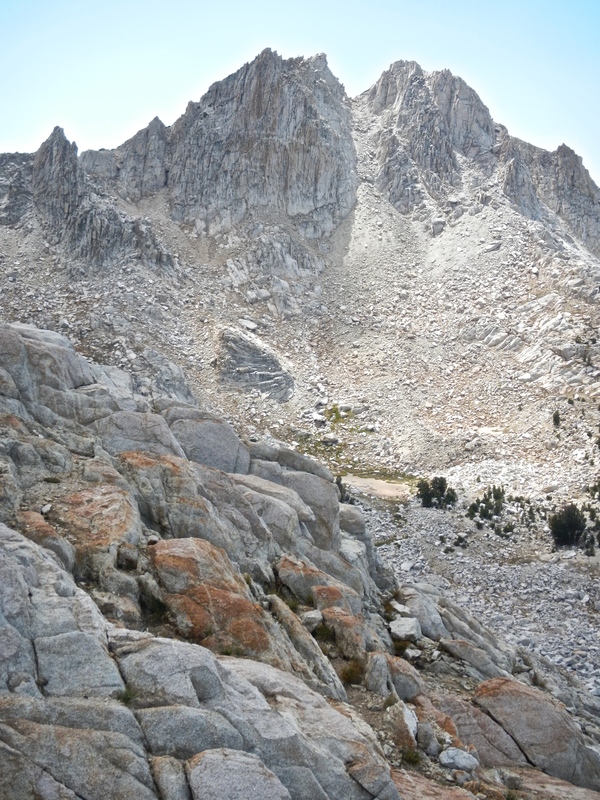 The trail headed up over the ridge in front of us and then swung left up to the pass. Too many lakes! 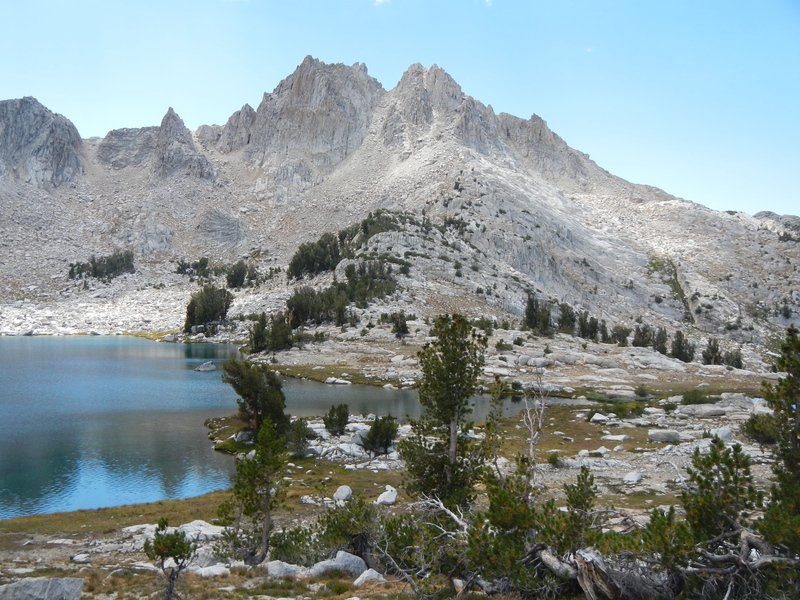 I think this might be Squaw Lake. This area was dotted with place names that are not PC. 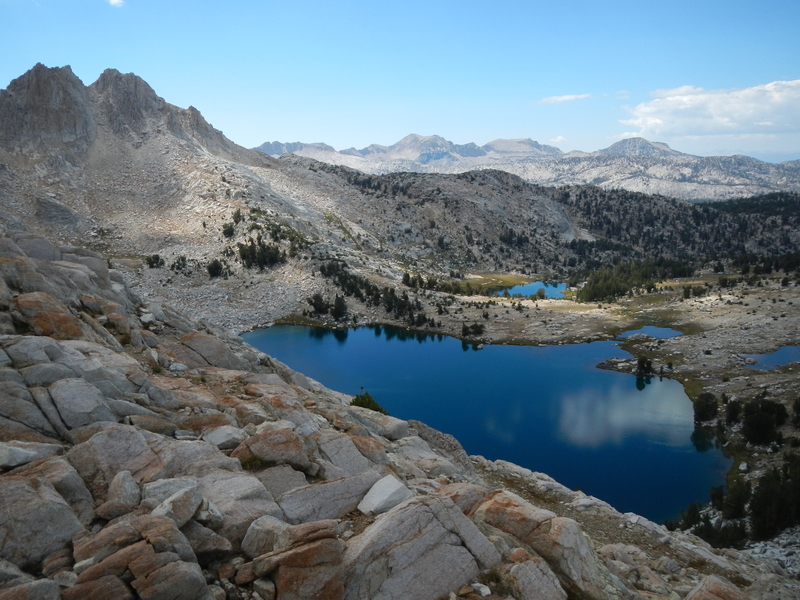 Almost to the pass, looking back at Squaw Lake. Party at the Pass! 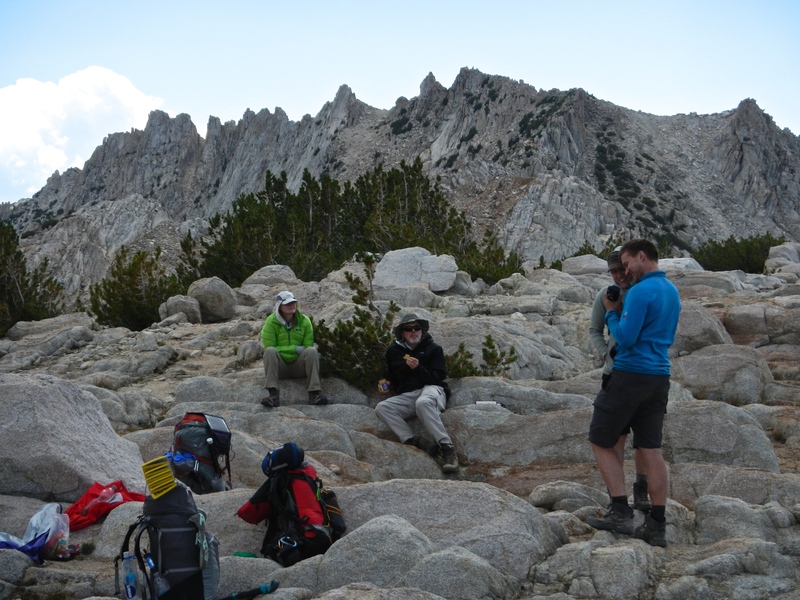 A good place to congregate and discuss gear. Our campsite on Silver Pass Creek. 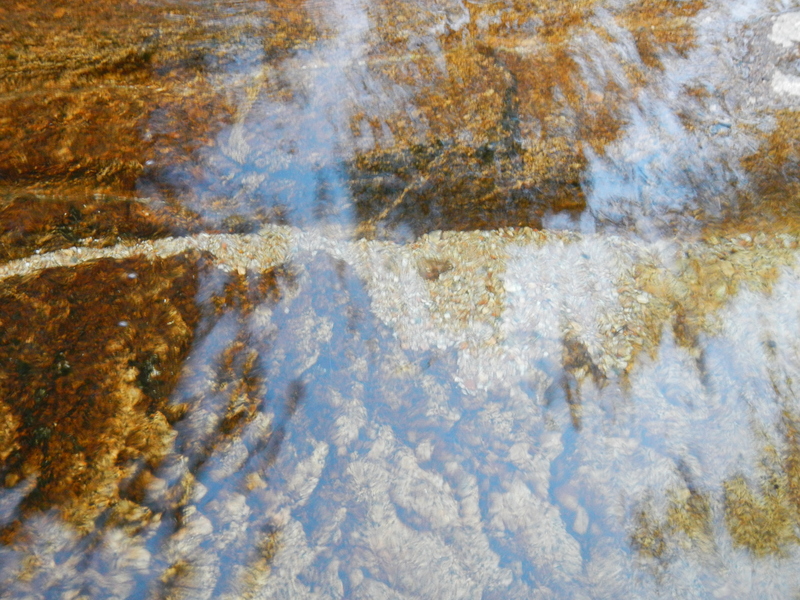 The star of the show: Silver Pass Creek. Oh, the water! So clear! This is about 2 feet deep. 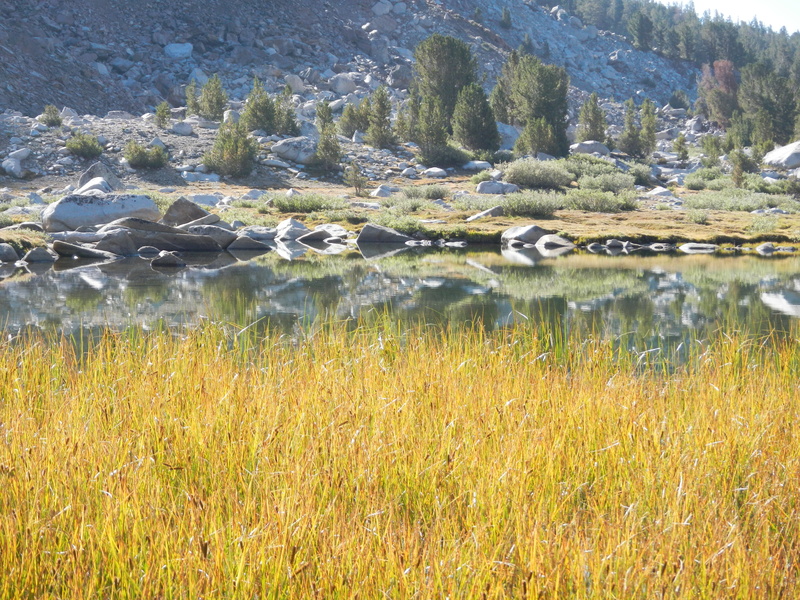 Do you know if these beautiful lakes and creeks at their normal water level, or are they lower than usual because of the drought? Many of the lakes are lower than usual, I think. You can see where the water line generally is. 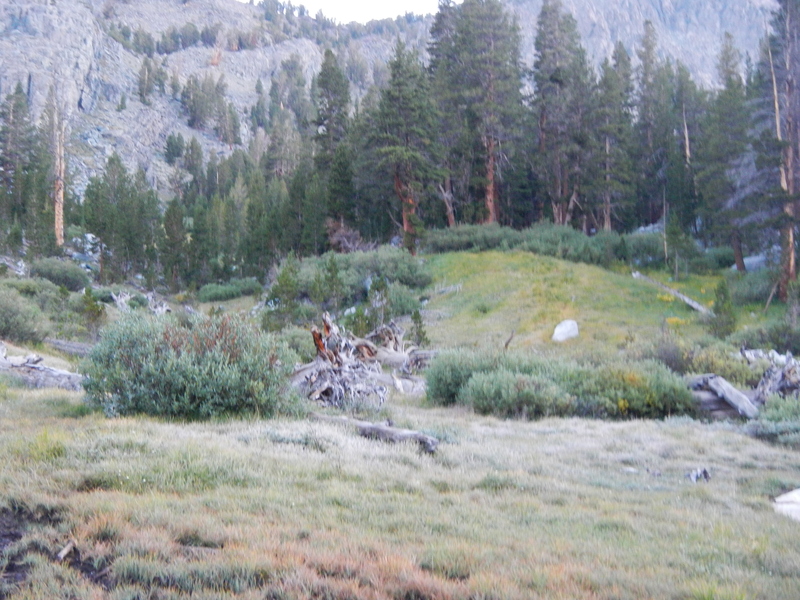 All the creek crossings were very easy, and in big snow years, some of them can be downright dangerous, even in August. We were surprised at how much water there was everywhere, even with the drought. Seems like the water just springs right out of the mountains! Of course, without some good snow and water years, that can’t happen indefinitely. Oh, I am caught up now. Ready for more. You did the trip Phil always dreamed of. Methinks Betty should write a book on how to eat well on the trail, including recipes. I always cringed at the thought of those freeze dried “just add water” meals that contain so many preservatives. Monika – I have a PDF on Trail Food that I created for a class on DIY hiker meals. Happy to send it to you if you would like.